Since embracing digital technology, Africa has witnessed significant transformation in many sectors. From agriculture to education, governance to finance, and health to infrastructure, information and communications technology (ICT) is shaping our lifestyles – lifting millions from poverty , providing alternative sources of income and employment, and extending the reach of quality healthcare to rural and remote areas. Women have been at the forefront of many of these innovations. 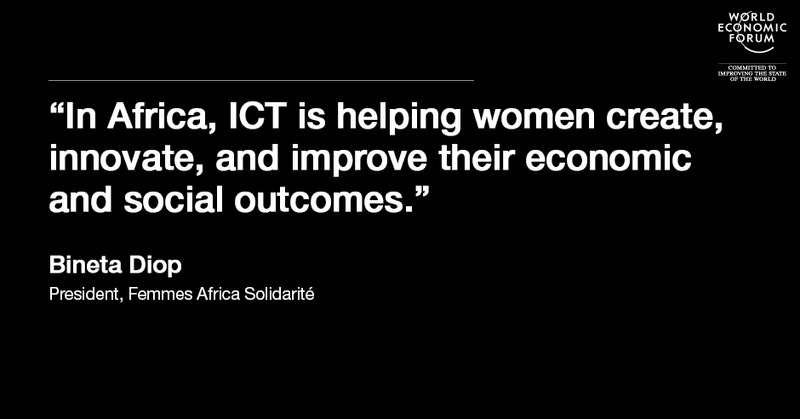 Indeed, in Africa, ICT is helping women create, innovate, and improve their economic and social outcomes. At the April 2016 African Development Week, one panellist argued that ICT is the oil and gas of the 21st century: the commodity that present and coming generations will depend on as they carry out their daily activities. We are seeing this unfold in Africa, with the number of internet users rising from 5% or less in the early 2000s, to about 20% in 2015 . Although these figures are still low compared to Europe and America, there has been significant progress – we’ve seen a 300% increase in internet users in about 15 years. And although a majority of Africans are yet to join this new order, their lives are still immensely affected and influenced by technological advancements . A good example of transformation in Africa is Rwanda. “Were the killings a prelude for worse to come?” a 1995 issue of the New Yorker asked, nine months after the Rwandan genocide. The prospects post-1994 were pessimistic. These days, Rwanda leads in everything from gender parity in politics to the ICT revolution, to continental integration. Today, Rwanda is a prelude to the Africa we want: efficient, modern and integrated. In Rwanda, we’ve seen women like Akaliza Keza Gara – now a member of the 4Afrika advisory council for Microsoft – establish companies that are encouraging other young people to venture into ICT . In other parts of Africa, initiatives such as She Leads Africa are empowering young women to excel in business, and inventions like Ushahidi , a crisis-mapping tool, co-created by two Kenyan women digital activists, Ory Okolloh and Juliana Rotich, are catering to vulnerable communities. But even when women are not inventors, they benefit tremendously from these technological leaps. Alain Nteff, a young Cameroonian entrepreneur co-founded Gifted Mom , a mobile health platform that uses low-cost technology to help mothers and pregnant women access medical advice in remote and rural communities. In the finance sector, M-Pesa , the leading mobile money transfer service facilitates business transactions, and has helped thousands of female entrepreneurs build thriving small and medium enterprises. So if the digital transformation is being powered by and is empowering women, what can we do to accelerate it? It starts with getting more female voices in all walks of like. Once again, we could turn to Rwanda for lessons. Twenty years after the genocide, Rwanda has the highest representation of women legislators in the world – at 64% of its parliament. On top of that, half its cabinet ministers and half of its supreme court justices are women. How did it achieve this? In its post-conflict planning, Rwanda recognized the importance of quotas for inclusive and equal transformation. Beyond numbers, the presence of more women in policy-making has meant transformative policies that benefit both men and women. It has also led to a change in attitudes about gender roles, as Rwandan MP Juliana Kantengwa has pointed out. That’s because greater gender parity in politics has a trickledown effect on society from policies to attitudes. And that can trickle down to the field of technology. I would like to invite young girls and women in Africa to embrace the fields of science, technology, engineering and mathematics, to help solve the problems facing our communities. Doing so would allow our continent to shift from an exporter of raw materials into a powerhouse of manufacturing, industry and job creation.